The EuroTech Universities High Level Event 2018 took place on 6 November at the Representation of the Free State of Bavaria to the European Union. 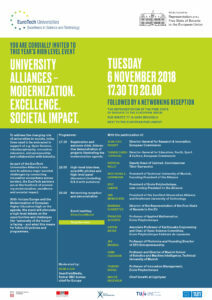 Browse the programme of our interactive showcase of state-of-the-art technologies and high-level panel debate on the challenges faced by the “university of the future”. To address their changing role in society, universities need to embrace initiatives in support of Open Science, interdisciplinarity, innovative education, entrepreneurship, as well as collaboration with industry. As part of the Alliance’s joint mission to address major societal challenges by connecting innovation ecosystems across borders, the EuroTech Universities are at the forefront of promoting modernization, excellence and societal impact. With Horizon Europe and the Modernization of European Higher Education high on the agenda, the event will stimulate a high-level debate on the opportunities and challenges the “university of the future” is facing – and what this means for future EU policies and programmes. Follow the event on Twitter: #EuroTechModel.